Known as a staunch supporter of the LGBTQ community in his province, he really made a stand fighting for their rights. It doesn’t matter what political spectrum you belong, as long as you respect the causes and advocacies of the gays in pursuit of equality and holistic integration in the society. The country is celebrating the success of the newly crowned Miss Universe, Catriona Elisa Magnayon Gray, held in Bangkok, Thailand. Definitely, her kababayans in Albay, Bicol, where her mother came from, are doubly excited with her homecoming. She’s expected to return today in the country. Being the fourth Filipina to win Miss Universe gave pride and joy to the nation, and brought unity to everyone in spite of political differences. Unknown to many, aside from Catriona Gray, there’s another Bicolano who created ripples and fame in the international pageantry, particularly in this year’s Miss Universe. Although he was just behind the scene, but he is mainly responsible and a living conduit to the achievement and almost-perfect performance of Miss Vietnam, H’Hen Nie, proudly known to be a member of the Rade ethnic minority group, found in the southern part of Vietnam. Before Anjo was catapulted as an international pageant trainer, he had years of exposure in his native Bicol, particularly Naga City. Since his college days, he’s been active in beauty pageants. Even before Venus Raj joined Miss Earth Philippines and gained national fame, he was the first to discover this dark young lass. And eventually she won 4th runner-up in Miss Universe 2010. Also under his tutelage was Joycie Nocomura, Miss Earth Philippines-Water 2007. He was also part of the maiden team of Cory Quirino when the local franchise of Miss World-Philippines was given to her in 2011. And because of this passion, he established Modelo Bikolano in 2013, the first and only recognized modular training camp in Bicol for aspiring models (teens and kids). And in 2014, Anjo was hired by a group handling Miss Vietnam beauty pageant to train their winners sent in international pageant. Miss Vietnam-World 2015 (Lan Khue) reached Top 11, and Miss Vietnam-International 2015 (Thuy Van) won 3rd runner-up. 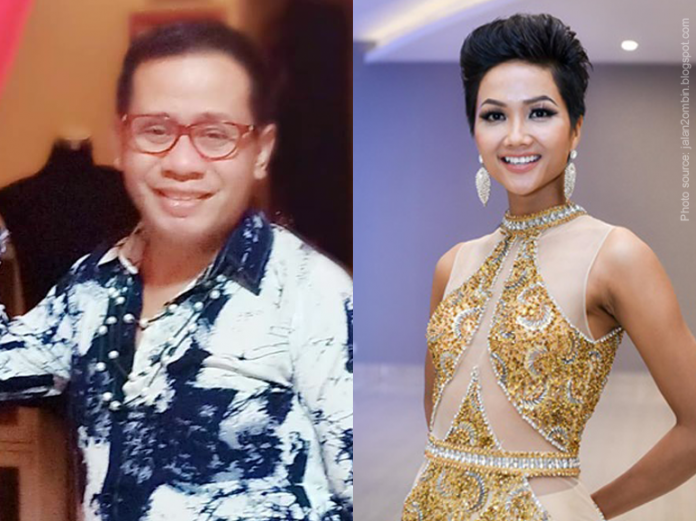 And this year, with Miss Vietnam, as one of the Top 5 finalists, he considered it as his biggest achievement and a blessing, indeed, as a trainer. “We trained for a month before Miss Vietnam flew to Thailand for the Miss Universe pageant,” Anjo revealed. “I think the most difficult part in our training was first and foremost the language. As everyone knows she speaks little English. Then toning down the movements for her to move classier. The best consolation during our training was the fact she was focused, determined, and her life story is so inspiring. And that I want the whole world to know. A woman with a big heart. Previous articleFor Personal Hygiene…It Must Be Clear! Next articleDC Super Heroes Celebrate Justice League Christmas!